I love hosting dinner parties. Throwing a great dinner party is a great achievement for a hostess. Entertaining and be stressful. 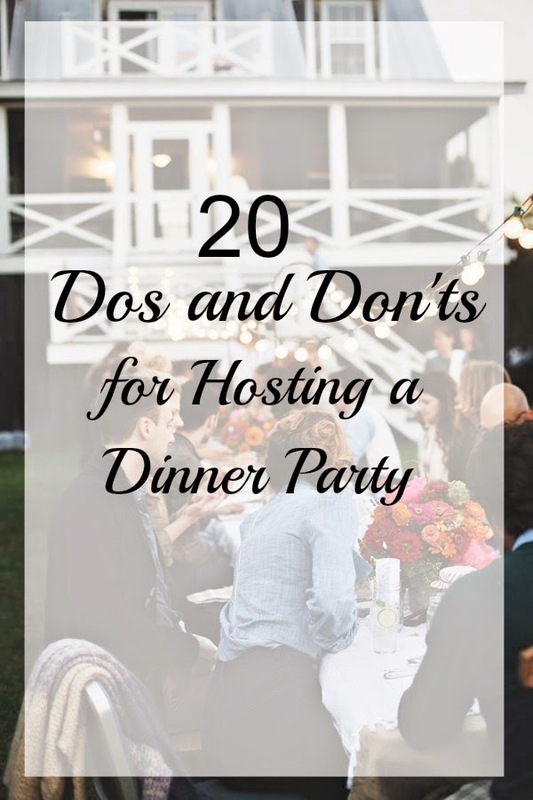 Over the years I have developed a few dos and don'ts that help remove most of the stress and if followed when almost ensure that everyone involved has a great time. ONE // Do make as much as possible in advance. Few things are worse than being in a rush trying to get everything ready when your guests have already started arriving. TWO // Do have a playlist prepared. It will help set the mood and make the atmosphere more festive. THREE // Do take your guests dietary restrictions into consideration. This doesn't mean preparing an entire special menu for each guest but you should provide options so no one feels left out. FOUR // Send out invitations. It will help get your guests excited and make all the details for the dinner easy to find. FIVE // Do serve dessert. It doesn't have to be homemade but I promise you your guests expect dessert. SIX // Watch the number of guests you invite. I think 6-8 is the perfect number. It keeps conversation flowing without people breaking off into groups. This being said always be willing to be flexible. If someone has an out of town guest visiting make room at the table for one more so your guests will not be prevented from attending. SEVEN // Do a little tidying up before everyone arrives. Make sure the common areas of your home where your guests will be are clean the day before the dinner. This includes having clutter put away and having a well stocked bathroom. EIGHT // Create some atmosphere. Light a few candles. Have a pretty centerpiece. Use cloth napkins or your nice dinnerware. Choose a few things to help the meal seem extra special. NINE // Stick to a simple menu. A dinner party shouldn't be fussy or stressful. Stick to a simple menu with quality ingredients and the food will be delicious. TEN // Make extra food. It is better to have lots of leftovers than for someone to leave your party hungry. ELEVEN // Don't get hung up on details. Do the best you can and don't worry if something goes wrong. The point is to have fun not to be perfect. TWELVE // Don't forget appetizers. Guests will arrive at different times. Finger foods ar a great way to get the party started until it is time to serve the main course. THIRTEEN // Don't try out a new recipe. This is a time to rely on tried and true favorite recipes. FOURTEEN // Don't rely on guests to bring essential items. There is always the chance that they will be late or forget and then you will be left trying to come up with a plan B on the spot. FIFTEEN // Don't serve the food late. People get grumpy when they are hungry. SIXTEEN // Don't ignore any guests. No one should be invited to a dinner party and then feel alienated. Include everyone in conversations and if some of your guests do not know each other make introductions. SEVENTEEN // Don't invite all strangers. Most of your guests should have something in common other than knowing you. I think it is a good rule of thumb to introduce no more than 2 new people into your group at each dinner party. This helps keep the event from getting awkward while still introduce your friends to new people you know and really like. EIGHTEEN // Don't start tidying up as soon as everyone has finished eating. Cleaning up kills the mood fast. Instead linger at the table or move into living room for coffee and enjoy your company a little longer. NINETEEN // Don't go to bed without cleaning up. Number Eighteen being said once your guests have left you should definitely tackle the worst of the cleaning. Believe me the mess will look much worse in the morning. TWENTY // Don't apologize. So what if everything isn't perfect. No apologizes are needed. A week later no one will remember if something was a little overcooked. All they will remember is the great time they had. Great tips! Perfect timing as I plan to hold a party soon. These are great tips-- and really important to remember! Thanks for sharing! These are all such helpful tips. Thanks for sharing! I love it, these are really great tips. I would love to host more dinner parties. It's the cleaning up around the house that i hate, haha.